AyeView is your image viewer, converter and browser runs on Windows. 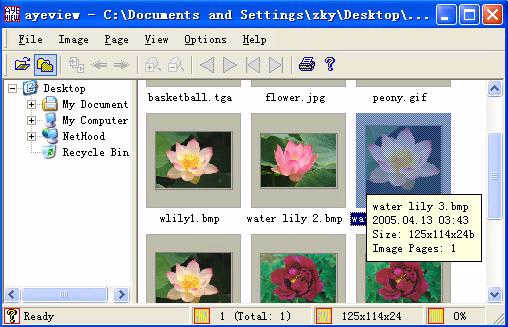 AyeView - Image Viewer is your image viewer, converter and browser runs on Windows. You can browse, open, view, slide show, convert, print your images of various image formats with AyeView, such as tif, tiff, jpg, jpeg, jp2, j2k, png, bmp, wbmp, gif, pcx, dcx, ico, cur, emf, wmf, pnm, ras, tga, fmf, etc. You can also convert your images to other images formats. You can browse images in thumbnail, slide show and print preview your images. AyeView is much more smaller in size, without other plug-ins or ocx. Print and print preview your images. Acloon VideoViewer - effective video AVI viewer Mpeg viewer "add-on" for any standard window. Hot ! Accessory Media Viewer - An all purpose TIFF Viewer, TGA Viewer, JPEG Viewer that allows you to Find, View, Edit. and Print Picture.